Configuring email for SuiteCRM provides a wide range of features, including sending personal emails to contacts, automatic creation of cases, sending notifications for events using workflows and sending email marketing campaigns. This document explains the different types of mail accounts and how to set them up. For information on reading and sending email in SuiteCRM using the Emails module, see the Emails module guide. The outgoing mail server is used to send automatic email notifications (such as record assignment notifications) and emails sent as workflows actions. The outgoing mail configuration will need to be set up by an Administrator. See Outgoing Mail Configuration for instructions on setting up the default outgoing mail configuration. Other outbound accounts can be configured in addition to the default account for specific purposes, such as sending Campaigns. These can be set up from the Admin panel, under outbound accounts. If no other outbound accounts are configured, the default outgoing mail server account will be used. A personal account is used to view and send email from a personal email account within the Emails module. This account can be an internal or an external email account. Emails from personal accounts are not stored in SuiteCRM unless manually imported. Personal accounts can be configured by the user from their user profile. 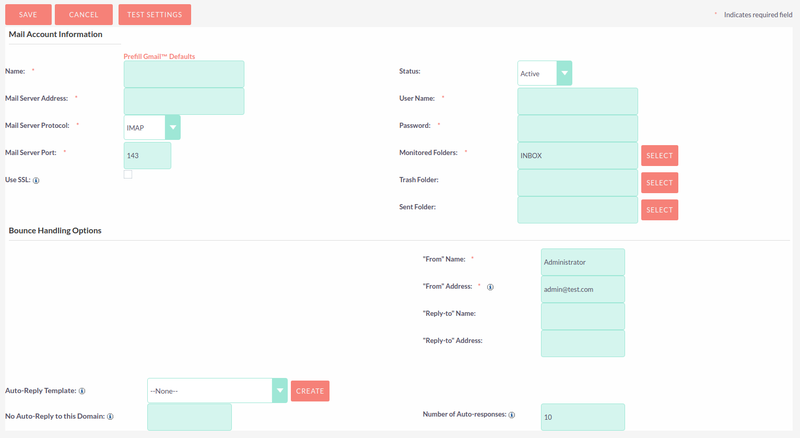 Administrators can configure personal accounts for other users. See Managing User Accounts for instructions on setting up a personal account. Group accounts are used when you need several users to be able to view and send email from one mail account, for example a support or sales mailbox. Group accounts can be set up to automatically import emails and create Cases from incoming email. Group accounts must be set up by an Administrator. Access to a group account must be granted by an Administrator. Set up a group account from the Inbound Email page. A Bounce Handling account is used with Campaigns to handle bounced mail notifications when emails are undelivered. You will need to set up a Bounce Handling account in order to send a Campaign. Bounce Handling accounts must be set up by an Administrator. Once set up, users can select the bounce handling account when setting up a campaign. 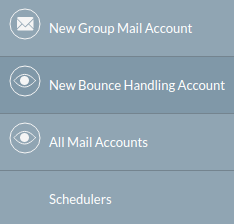 Set up a Bounce Handling account from the Inbound Email page. The outgoing mail configuration settings are used to send system notification emails such as password reset emails, record assignment notifications and workflow email notifications. Select the mail provider by clicking the appropriate button and then enter the required configuration information for your system. Verify that any default port/protocol settings are valid for your setup. When this option selected, all users will be able to send emails using this outgoing mail account, which is the same as that used to send system notifications and alerts. If the option is not selected, users can still use the outgoing mail server after providing their own account information. Click SEND TEST EMAIL to check your settings. You will be asked to enter an email address for the test message to be sent to. A verification message will be displayed if the email was sent successfully. Check that you have received this test message. Once the settings have been verified, click SAVE so that these settings are retained before leaving the settings page. If the test message was not sent successfully, check the log file in system settings for any further error messages which may assist with resolving the issue. Verify that all port/protocol settings are correct and that the username/password entered is correct and has the correct permissions to send mail. When selected, users will be emailed when a record is assigned to them. Where the mail server permits this, the assigning user’s name and email address will be included in the From field of the notification email. Otherwise the default system outbound account will be used. 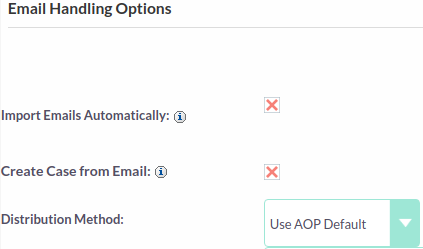 SuiteCRM 7.10 introduces a new Confirmed Opt In feature which provides two opt in settings for email addresses: Opt In and Confirmed Opt In. See the Confirmed Opt In documentation for further information on these settings. Tags selected here will be stripped from inbound email and will not be displayed in the Emails module. Click SAVE to retain your settings. Set up group mail accounts for monitoring inbound email and bounce handling accounts for campaigns here. You can also manage personal inbound mail account information for users from this panel. A group email account allows more than one user to access a particular mail account. This can be useful for sales or support email accounts for example. In addition, group accounts are also used for sending email campaigns. See the Campaigns documentation for more information. SuiteCRM can also be configured to automatically import emails and to automatically create cases from email. Select New Group Mail Account from the Sidebar. You will need the username and password for the account you are adding, plus the mail server address. The mail protocol supported by SuiteCRM is IMAP. Monitored Folders are the folders which are checked for new (unread) mail. Inbox and Trash folder names must be specified here. Click SELECT to connect to the mail server and select the relevant folder(s) from the popup dialog. Check this box to import emails automatically, which means that records will be created in SuiteCRM for all incoming emails. These associated emails can then be viewed via the History subpanel of the relevant record. This setting is selected by default in SuiteCRM. Check this box to set up SuiteCRM to create a Case record from an incoming email. Select a Distribution Method to specify how cases created from incoming email are assigned to users. This will use the AOP default settings, configurable via the Admin panel. Enter a username or click the select arrow to search for a user. Every automatically created case will be assigned to the specified user. Select All Users or an existing security group or role. Cases will be assigned to the next member of the specified group or role. Select All Users or an existing security group or role. Cases will be assigned to the member of the specified group or role with the least case assignments. Select All Users or an existing security group or role. Cases will be assigned randomly to members of the specified group or role. If SuiteCRM has been configured to auto-create cases, you can select or create an email template to use as an automated reponse to notify the sender that a case has been created. If no template is specified here, this automated reponse will not be sent. No auto-responses will be sent to the specified domain. Use this for example to exclude your company domain, so your users do not receive auto-reply messages. This setting specifies the maximum number of replies to send to a particular email address in a 24hr period. Used as the from address where supported, otherwise the system outbound account will be used. When checked, the From Name and From Address for this account will appear as a From option when composing an email for all users that have access to this group account. Once configured, all inbound accounts are listed under Inbound Accounts on the Admin panel, from where they can be edited or removed. A Bounce Handling Account is used to manage bounce notifications for an email campaign. Bounced email addresses are recorded in the campaign status. 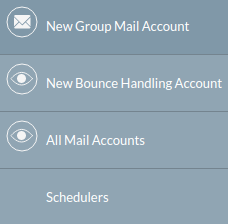 Once created, the bounce handling account can be selected by users when setting up a campaign. Select New Bounce Handling Account from the Sidebar. Enter the configuration details for the bounce account you are configuring. You will need the username and password for the account, plus the mail server address. Your system administrator will be able to supply these settings. The mail protocol supported by SuiteCRM is IMAP. Monitored Folders are the folders which are checked for new (unread) mail. Inbox and Trash folder names must be specified here. Click SELECT to connect to the mail server and select the relevant folder(s) from the popup dialog. Scheduled campaign emails are queued here until the scheduled job runs to send them out. By default this is the Run Nightly Mass Email Campaigns scheduled job. See the Scheduler section for further information on scheduled jobs. Click SEND QUEUED CAMPAIGN EMAILS to send them immediately without waiting for the scheduler to do so.